I can’t believe it’s already been 5 weeks since I embarked on this keto experiment. To be honest, I never thought that I would ever be able to sustain this diet for so long. But this time, seeing how I knew I wouldn’t be able to train for a while, I decided that I was going to give it an honest shot and stick with it no matter what. I can’t say that the last 5 weeks have been a walk in the park and that I now think of keto as the biggest revelation ever. In fact, I’m still on the fence as to whether I like it or not. I definitely need more time to decide, so I intend to keep going for a minimum of 12 weeks total. No matter what! Boy did it ever feel good to hear that. Because trust me, so far, this keto thing hasn’t been much fun for me. For starters, I feel hungry. A lot. Yes, still. But then again, that might be because I also put forth a no snacking/grazing rule for myself, cutting back on my daily calorie intake by the same token. So I probably can’t blame my hunger pangs entirely on keto. In case you’re interested, I now eat at a slight caloric deficit, keeping my intake at around 1950 calories per day and I try and stick as closely as possible to the following macros: 25g net carbs, 90g protein and 165g fat. Then, for a couple of weeks, I felt really tired, my brain was unbelievably foggy, I felt like I had no energy, no inspiration, no desire to eat or cook. Or maybe I just didn’t really know how anymore. I’m used to eating massive amounts of veggies at each meal and removing them from my diet was a very tough thing for me to do. 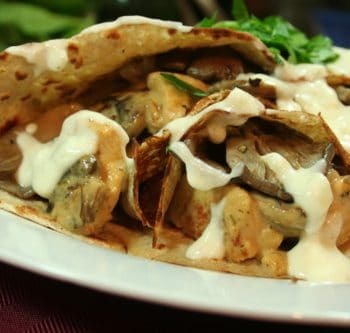 That, and the fact that there’s only so many dishes one can create which contain loads of fat, a moderate amount of protein and very little veggies. 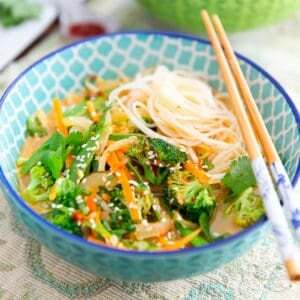 I needed to find a way to create dishes that would really call my name as well as satisfy my appetite. And that’s precisely what I did! 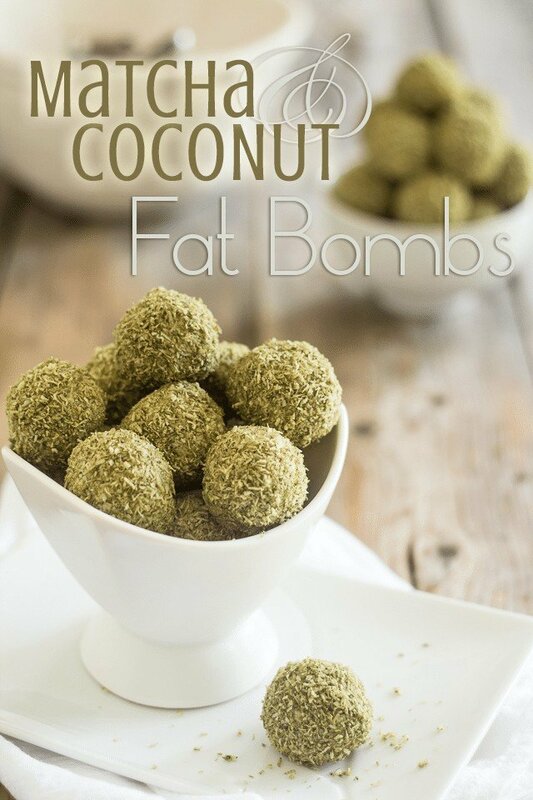 To begin with, I started experimenting with fat bombs. I immediately fell in love with them. They sure are a fun and tasty way to boost one’s daily fat intake, so I guess you can expect me to post quite a few variations on that same theme in the next few months. I feel I should warn you, though: I don’t do “sweet” fat bombs. My body just doesn’t seem to have a good psychological or hormonal response to all things sweet, so the further away I stay from sugar and sweeteners, the better off I am. 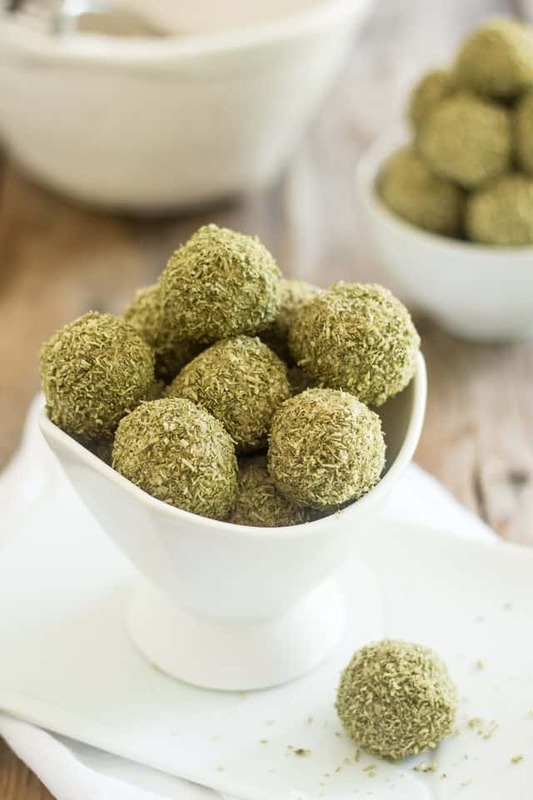 So just like the Choconut Almond Butter Cup that I just recently shared, these Matcha and Coconut Fat Bombs haven’t been sweetened in the least. But hey, it’s not because they’re not sweet that these fat bombs don’t taste good. In fact, they probably wouldn’t be as good if they were sweet. 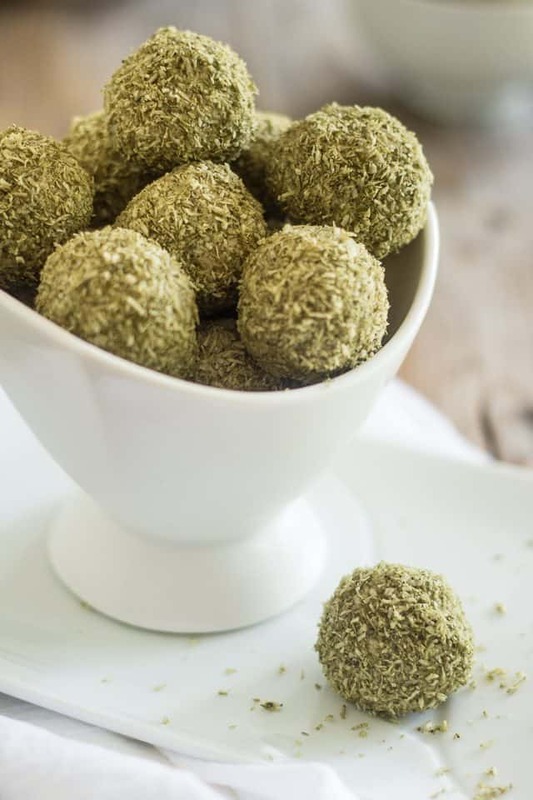 In their current state, you get to appreciate their full flavor and creaminess, as well as the little hit of bitterness brought forth by the matcha green tea. Add all the ingredients listed under “truffles” to a good sized mixing bowl. Note that it’s of utmost importance that your coconut oil be firm when you do this, so send it to the fridge for a little bit if you have to. Same goes for the coconut milk. While it’s not mandatory that you use only the cream part (although you could very well do that if you wanted to, more fat for you), your milk does have to be firm when you use it so make sure that you cool the can overnight. 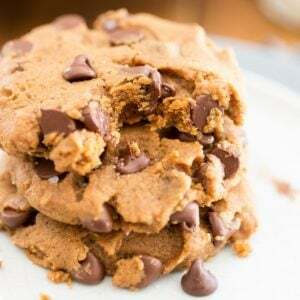 Mix all these yummy ingredients on high speed with a hand mixer, until light and fluffy, then send this to the refrigerator to firm up for about an hour. 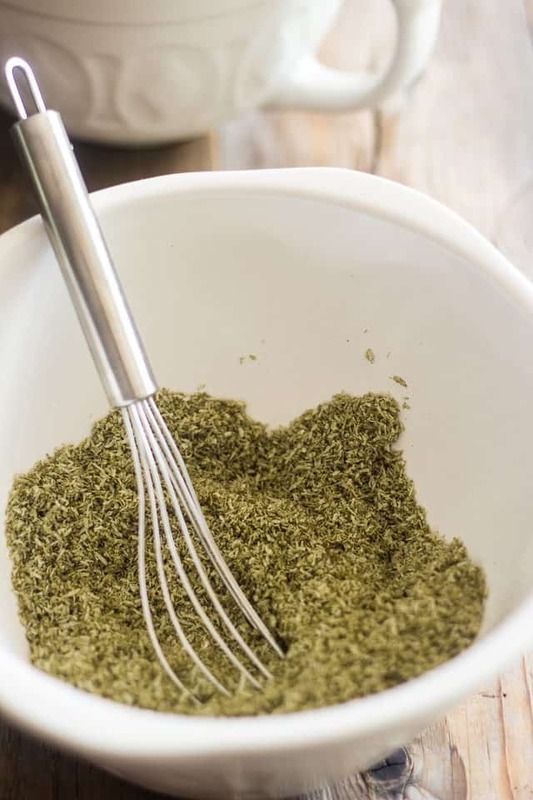 While the “truffle” mixture is firming up, mix the shredded coconut and matcha powder together in a fairly large mixing bowl. Set aside. 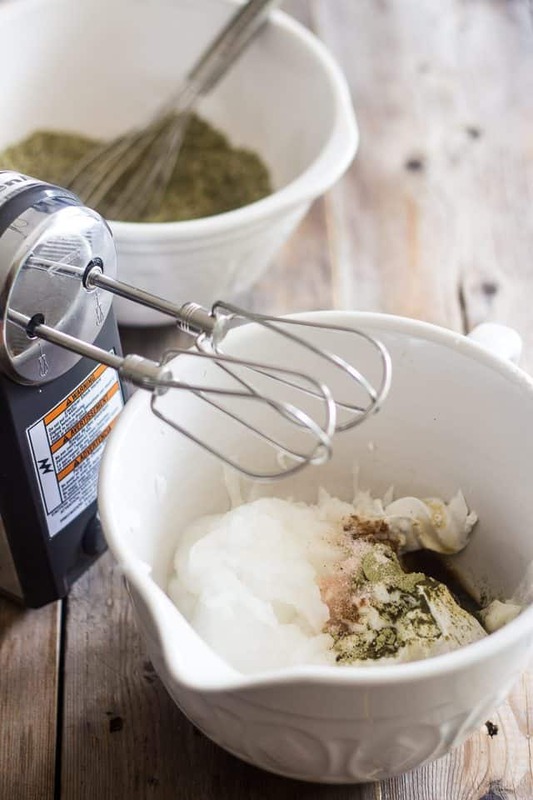 Your coconut mixture should have roughly the consistency of ice cream when chilled. Not the soft serve variety… the real thing, you know. Good old fashioned hard ice cream. 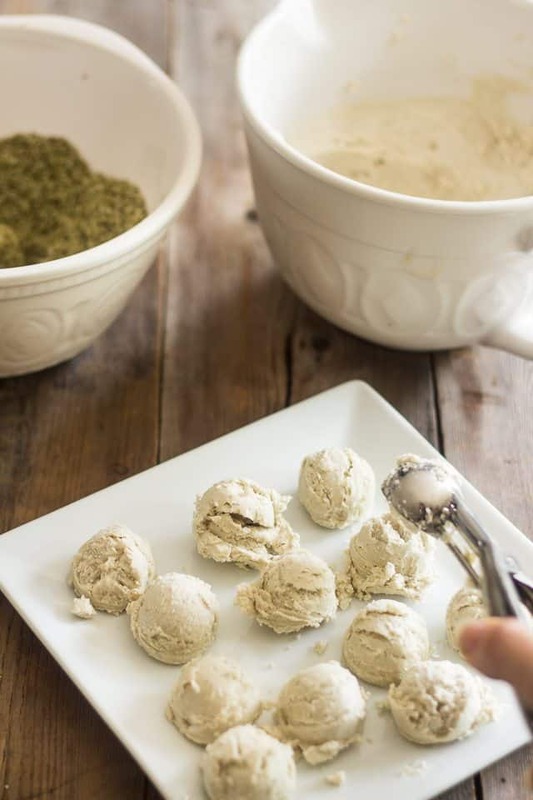 With the help of a small ice cream scoop form the cold “truffle” mixture into 32 little balls, roughly the size of a ping pong ball. Roll the balls quickly between the palms of your hands to shape them into perfect little spheres. Yes, that IS a bit of a dirty job. Unfortunately, there’s no way you can do this and keep your hands clean. Gah! But it’s a sacrifice well worth making, trust me. 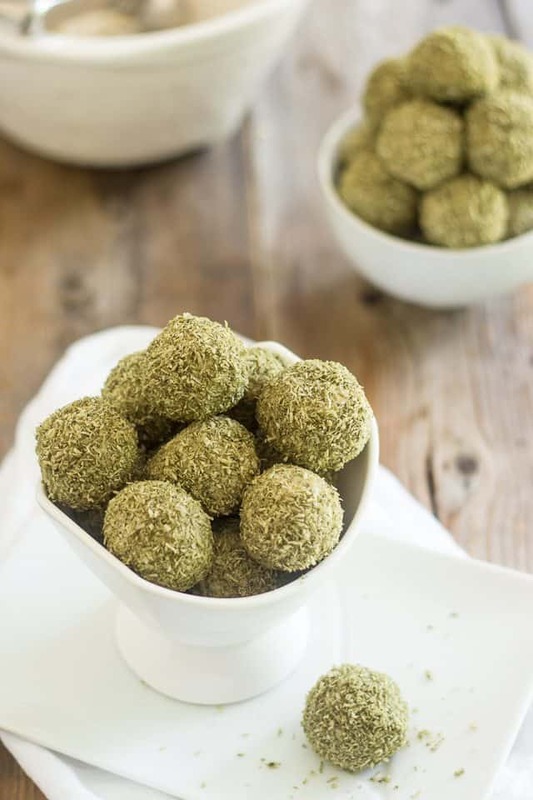 Drop each ball into the coconut / matcha mixture and roll them around until they are completely coated. Transfer your finished fat bombs to an airtight container and keep refrigerated for up to 2 weeks. So are the amazing salads that I eventually came to realize I could enjoy EVEN while keeping my carbs in check. I’ll have to share a few of those recipes with you soon. In the meantime, you can check them out on my Instagram. <– That one, for instance, has under 10g of net carbs, and it is HUGE! See that mountain of bacon on top of it? I made that myself, and you can make your own, too! So anyway, for now, I still don’t feel like my energy level is through the roof and returning to training hasn’t been the easiest thing for me (read, I felt like I was gonna die). But then again, I’m not sure I can I blame it entirely on keto. After all, I have been pretty much resting for the last 5 weeks. Going from light exercises and stretching to intense CrossFit sessions under the sun can be hard on one’s body. I’ll be able to better judge how keto and exercising work for me in a couple of weeks, I guess, once my body has fully recovered from that break. Hopefully, the next time I check in, I will have more positive things to say about this whole keto experiment. 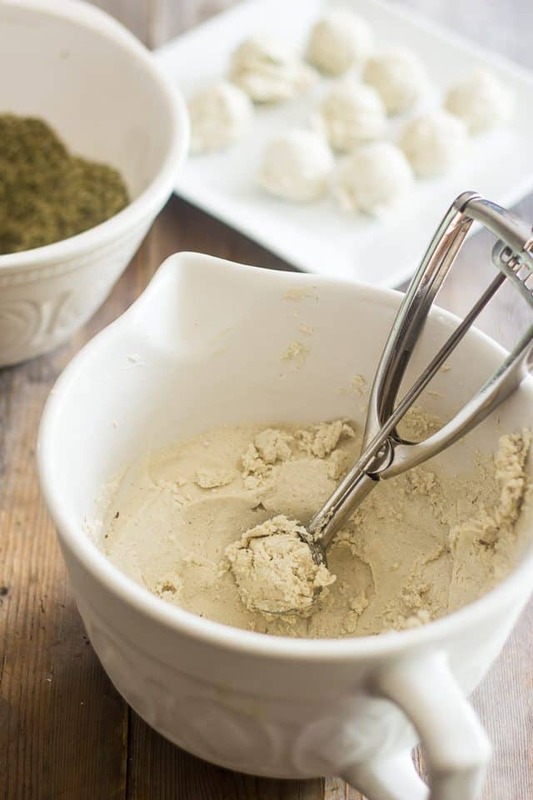 Add all the ingredients listed under "truffles" to a good sized mixing bowl. Note that it's of utmost importance that your coconut oil be firm so send it to the fridge for a little bit if you have to. Same goes for the coconut milk. While it's not mandatory that you use only the cream part (although you could very well do that if you wanted to, more fat for you), your milk does have to be firm when you use it so make sure that you cool the can overnight. 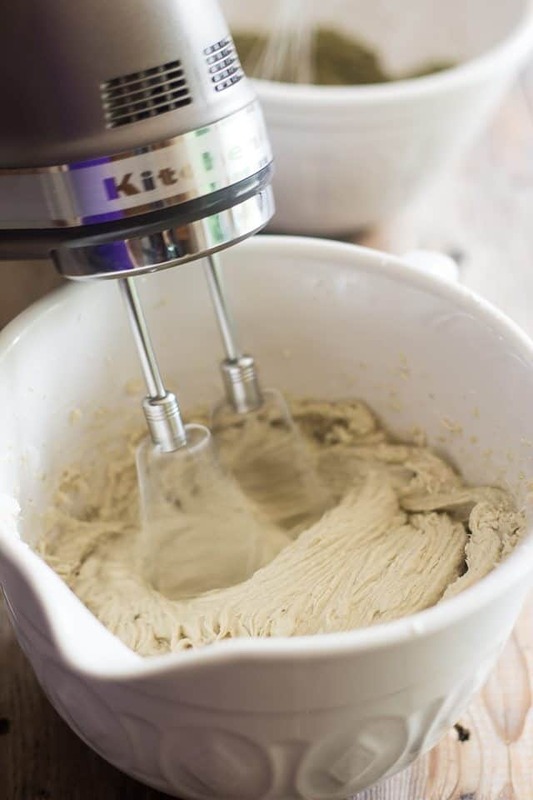 Mix on high speed with a hand mixer, until light and fluffy, then send to the refrigerator to firm up for about an hour. 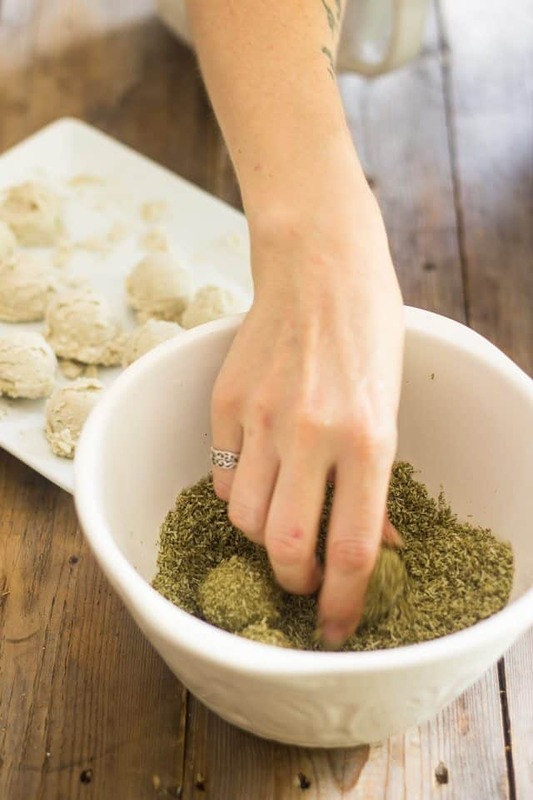 While the “truffle” mixture is firming up, combine the shredded coconut and matcha powder together in a fairly large mixing bowl. Set aside. 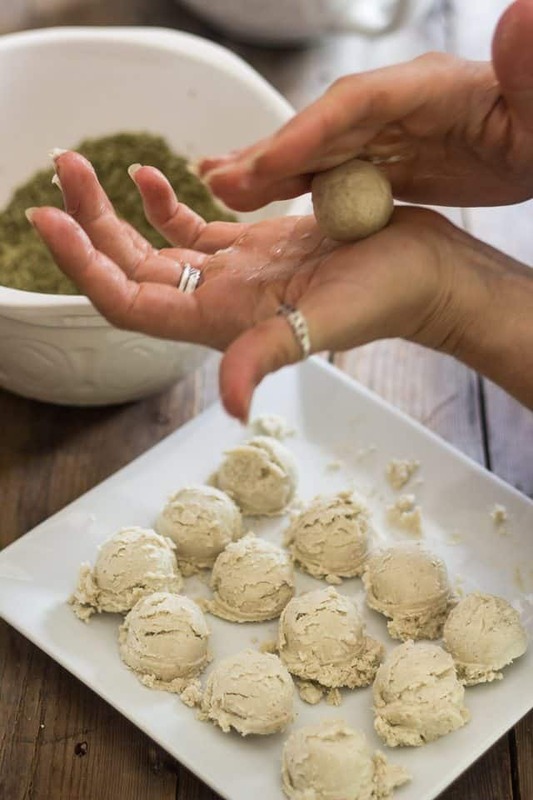 Roll the balls quickly between the palms of your hands to shape them into perfect little spheres, then drop each ball into the coconut / matcha mixture and roll them until completely coated. I really appreciate you sharing your experiments with ketosis; I’m interested in it I just haven’t consistently been able to stick to it – pesky carbs! 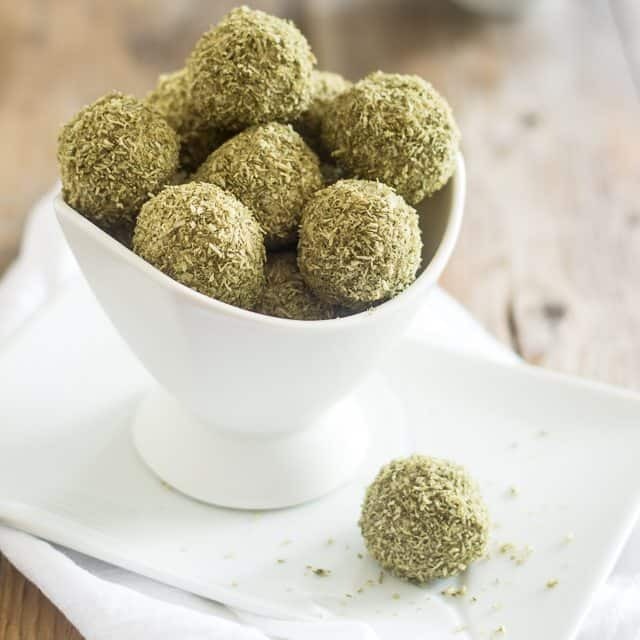 Keto or not, I know these truffles will go down a treat! It’s the first time I’ve ever been able to stick with it, Cat, (after 3 or 4 attempts) and still, I’m not finding it easy. Carbs are sooooo easy to overdo, and real hard to cut back too, I find. Happy to hear you appreciate my sharing my experience. Hopefully I’ll have more positive stuff to report soon! 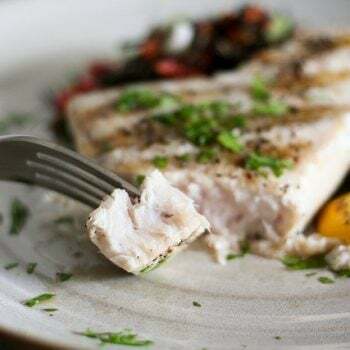 I was excited to read your post and see you are giving the ketogenic diet a try. This is my first week. I’ve been on Atkins for over a year and just finished reading Keto Clarity. Now I’m giving it a go. Thankfully for me I haven’t felt hungry or my energy zapped, but then again on Atkins I was controlling how many carbs I ate. Not saying it’s easy all the time though because I was on phase 4 of Atkins and at 70 carbs a day. Now with the Keto diet I’ve scaled back to 25. If you’ve been on Atkins for a while, sliding into Ketosis should be a piece of cake for you… a matter of a couple of days, perhaps. 70g is already pretty low! I can’t wait to read Keto Clarity myself… it should be in the mail as we speak. Hopefully, that too will help me stick with the program! Did you like the book? I spoke to soon, I was hungry yesterday 😀 I haven’t lost any pounds either. My main reason with trying a ketogenic diet is to keep my cholesterol numbers balanced but I’d love to lose at least 7lbs. I absolutely loved the book and am now reading the one on cholesterol. I plan on reading Keto Clarity again though because I read it pretty quickly. Both books are excellent. I have read that cholesterol is not the reason for high cholesterol but the inflammation but I hadn’t taken the time to do more research via the internet. I can only sit at the computer reading for so long, so I was happy when I found cholesterol Clarity. Too true: cholesterol isn’t the reason for high cholesterol. Did you read “It Starts with Food”? It’s one of the best books I’ve read (in fact, it’s pretty much responsible for my conversion to paleo) and I strongly recommend it. Yes, It Starts With Food is the one book I think every person should read. Thanks for mentioning it. I’ll have to pull it out and reread that one as well. My 13 year old daughter and I have completed a Whole 30. I was very proud of her. She continues to try to eat more Paleo but it’s hard when I’m still buying bread and cheerios for the rest of the family. I’ve been trying over the past two years to switch everyone over to a more Paleo lifestyle. Thankfully though I have cut out many foods for the family. I no longer purchase chips, oreos, food with dyes, juice drinks, etc. but I know I need to take the plunge with my family and get rid of the last of our wheat buying. I don’t know if the Keto diet is for me but I’m going to give it a whirl. Thanks for sharing your recipes! Those look awesome !! I NEED to try ’em. Thing is, I’m not too fount of match. Any advice what I could replace it with ? Take care and good luck with training ! I know well how it feels when you return after a (long) break…. it feels like you’re starting it all over again from scratch ! How about cacao powder, Phil? Or a little bit of ground cinnamon? Or chai spice? Or a mix of all that? When you say “carbs are energy” it really shows that you have no idea what being in a state of ketosis actually is, so I wonder why you’re bothering to comment? 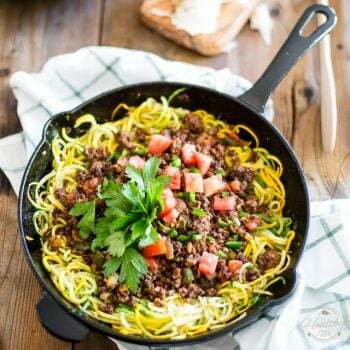 Have you tried counting total carbs rather than net carbs? I think after reading Keto Clarity, it’s my understanding that it’s important to track total carbs. If you’re getting too many carbs because you’ve been tracking net carbs, it could be fueling your hunger. Is there anything else you could use to coat the balls. Matcha is loaded with Caffeine and that is something I cannot have. 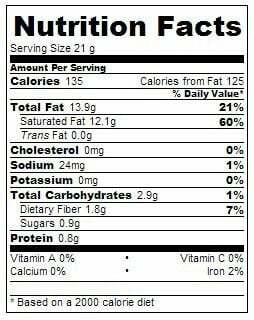 Cacao powder? Finely ground nuts? Or just use plain coconut! That should do the trick! 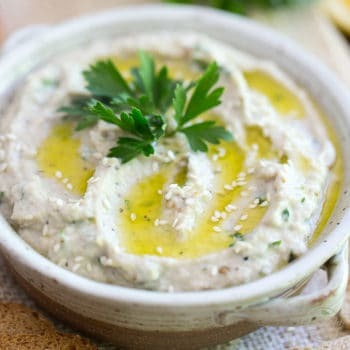 Ooohh I just stumbled across this recipe as I have a bag of matcha on the way, wanted to figure out some recipes for it, and tumbling it in some ground nuts could be pretty tasty, will have to try the original and some with chopped almonds. Well I have to admit I am not sure about these but there is always a first time for everything! Plus I enjoy trying new things. Thanks for sharing! Hope they’re to your liking, Rob! Like it says in the recipe, Hana, the bombs will keep in the refrigerator for up to 2 weeks. So if you think you will go through more than 32 bombs within 2 weeks, you can definitely make a bigger batch if you want to! I just wanted to share my experience here. I started the me to diet 2 weeks ago tomorrow. I have lost 11 lbs and I have more energy than I have in years! It’s been amazing for me!. But, I do know that I keep it under 20g of carbs and only 70g of protein. I found an app that has been suiper helpful…myketo, and it broke down the #s for maintenance, fat lose and for muscle gain 🙂 I also used the free trial at dietdoctor.com to help me with meal planning in the beginning so I could get it right at the start. 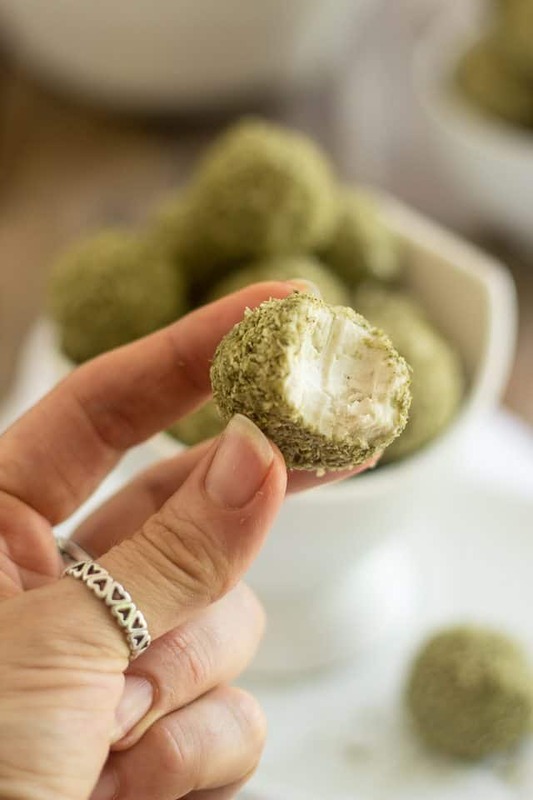 Thanks for a recipe of matcha coconut bomb. Thanks for sharing your Keto journey! 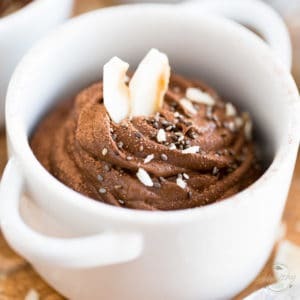 I’m thrilled that you’ve created vegan fat bombs without sweetener of any kind! 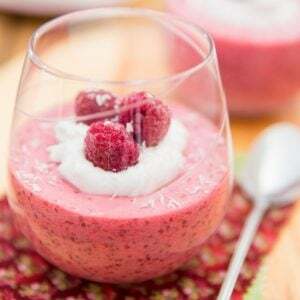 I can’t stand any of the artificial sweeteners and am severely lactose intolerant, so this is very refreshing! Thanks so much!